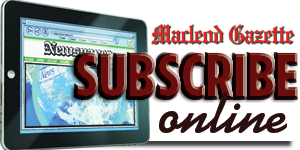 The Macleod Gazette is an independent newspaper published every Wednesday at Fort Macleod, Alta. The Macleod Gazette lays claim to being the oldest newspaper in Alberta. Two former members of the North West Mounted Police, C.E.D. Wood and E.T. Saunders, established the Gazette in 1882. At the time, the only two other papers in what was then the North West Territories were the Edmonton Bulletin and Battleford Herald. The Bulletin went out of business and in 1905 Battleford became part of the new province of Saskatchewan. The Macleod Gazette was honoured by the Alberta Weekly Newspapers Association as the best newspaper in its class in 2006, 2007, 2008, 2009 and 2010. The Canadian Community Newspapers Association recognized The Macleod Gazette in 2004, 2007, 2008 and 2009 as best all-around paper in its circulation category. The Gazette has also won numerous awards for news reporting, photography, opinion writing, education writing, coverage of the arts, sports reporting and design. The newspaper has changed owners several times in its history. In 2001 Frank and Emily McTighe bought the Gazette from Jack Murphy, who spent 33 years as an employee and later owner of The Macleod Gazette.